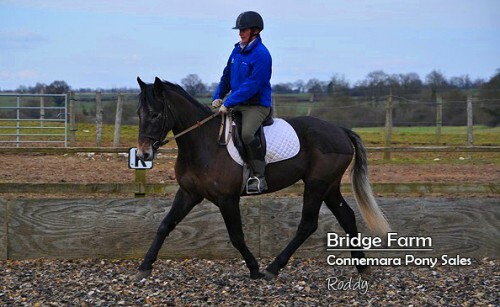 Roddy is Rising 4, a Steel Grey Connemara Gelding cross TBxID with a Super Kind Temperament. 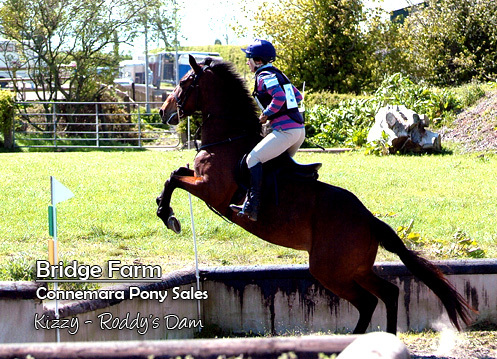 Roddy’s Dam also has a super temperament and has currently gained 39 dressage points. She always comes home winning or getting places. 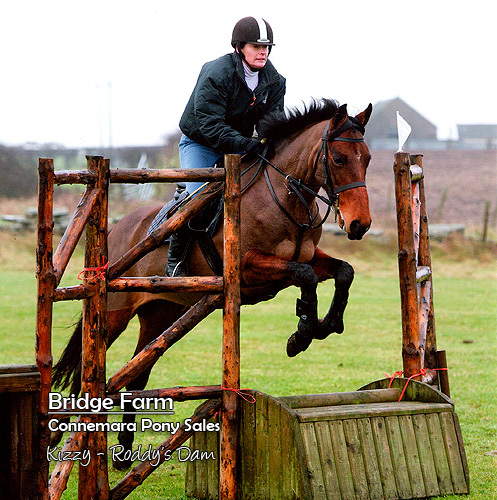 Her owner prefers dressage, but Kissy is also eventing and jumps whatever she is asked. As you can see by the photo of her jumping up the bank. 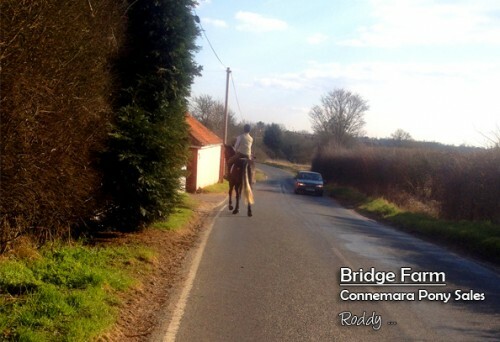 Roddy is a lovely Connemara gelding but isn’t the most beautiful horse, however he will improve as he matures. We believe he takes after his mother who was also a late developer. Roddy is broken and he is schooling very nicely in the arena. He has hacked out alone, in company, going in front and behind. In northern Ireland Roddy jumped ditches, trays, logs ect. We have jumped him over apprx 90cm which he found easier than very small jumps. 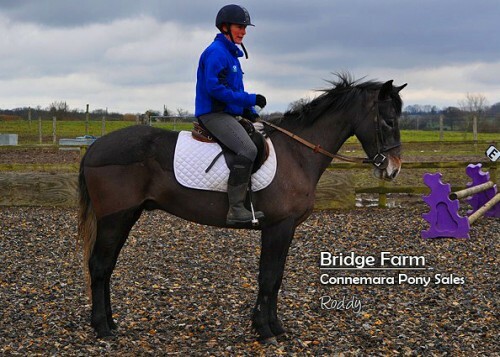 This very genuine Connemara Gelding cross is now ready for a new home and to start jumping novice courses cross country and showjump. We are also sure he will do a very nice dressage test. 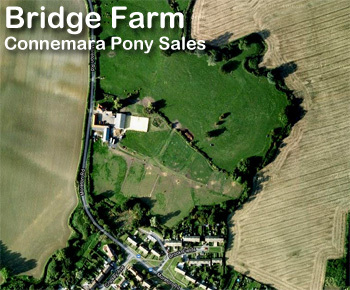 Asking a very reasonable sold for this genuine Connemara gelding cross. I managed to find a few photo’s of Kiz although they were taken a while ago not much has changed she’s just got better! 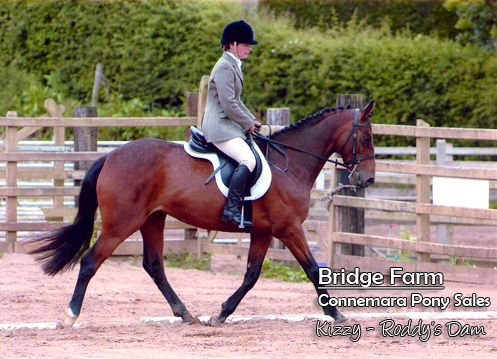 Kizzy was foaled in 2005 and was a late starter to the world of work. Kizzy has lovely manners and the best temperament you could ask for. She is great to take out to shows etc and is very well behaved both in the stable and travelling. She never kicks or threatens and will always do as she’s asked! She’s a very honest horse when it comes to jumping – keep her straight and she’ll go over it. To date she has done a couple of One Day Events at 75cm and one at 85cm although my preference is dressage. She currently has 39 dressage points and we’re working towards Novice level for the Spring leaque. We’re placed every time we go out which is always nice!